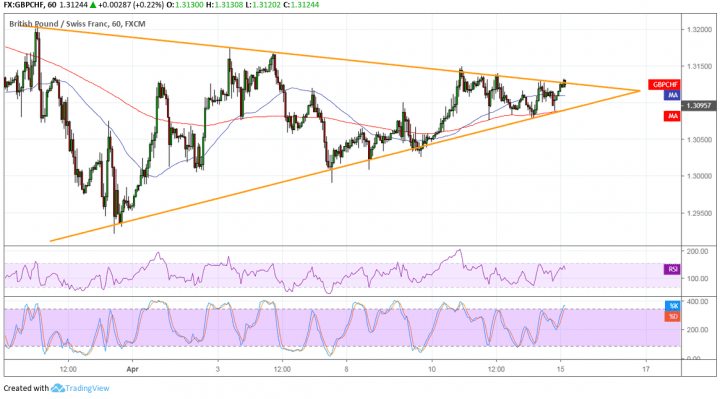 GBPCHF has formed lower highs and higher lows to create a symmetrical triangle pattern visible on its 1-hour chart. Price is currently testing the resistance and is approaching the peak of the formation so a breakout might follow soon. The 100 SMA is above the longer-term 200 SMA to indicate that the path of least resistance is to the upside. In other words, resistance is more likely to break than to hold or support is more likely to hold than to break. In addition, the 200 SMA lines up with the triangle bottom to add to its strength as a floor. A break past the triangle top could set off a climb that’s the same height as the triangle, which spans 1.2950 to 1.3200. Similarly a break below support could be followed by a selloff that’s the same size. RSI is heading up and has a bit of room to climb before reaching the overbought zone. This signals that buyers might still have some energy left in them until a breakout happens. Stochastic is also moving higher but is approaching the overbought region to reflect exhaustion among buyers. Turning lower could confirm that resistance is bound to hold and that a move back to support might be next. Sterling drew support from the EU’s decision to grant an extension until October 31 so lawmakers can iron out a Brexit transition deal. This was shorter than the flexible one-year extension expected but still enough to ease market fears of a “no deal” Brexit. This week, the attention could return to fundamentals as the UK will release its jobs, inflation, and retail sales figures. Stronger than expected data could continue to fuel rate hike hopes now that the exit date has been pushed back. BOE Governor Carney has a speech lined up and he is widely expected to share some thoughts on monetary policy with regard to Brexit developments.